By Constance Backhouse. Published by the University of British Columbia Press. Claire L’Heureux-Dubé was the second woman appointed to the Supreme Court of Canada, in 1987, and the first from Quebec. This deeply-researched biography takes us through the judge’s origins and life in the Quebec of the 1920s to the present, and its portrait of that society greatly enriches the books comprehensive, intimate, and insightful portrait of L’Heureux-Dubé herself. We learn a great deal about the role of women and women lawyers in Quebec society, the Quebec legal profession, legal education and the judiciary, as L’Heureux-Dubé ascended the province’s legal hierarchy to the Court of Appeal. Our understanding of the Supreme Court of Canada during the early Charter era is greatly augmented by this account, which deals with the gender and cultural dynamics, and the relations between Anglophone and Francophone judges, and the jurisprudential debates and controversies of the period. 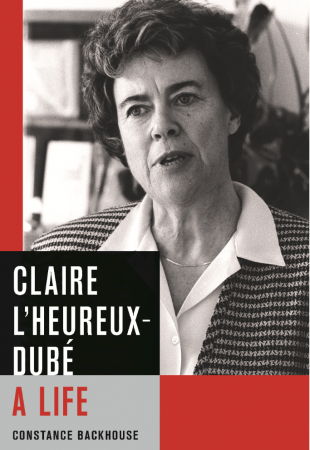 The book takes us beyond L’Heureux-Dubé’s retirement and into the various high-profile interventions she made into public life, including her contribution to the Charter of Quebec Values controversy. This is a must-read for anybody interested in Canada’s and Quebec’s modern legal history, in the role of women in law, and in what made this woman judge such a compelling personality.